Finishing 3L and Senior Week! For the last two weeks, variations of this message have cropped up on my facebook newsfeed as each of my fellow 3L’s have completed their FINAL final exam or paper. When I turned in my last paper, after two exams, I was hesitant to post such a shameless self-congratulations. But, alas, I caved in. Done with twenty-plus years of school!! Modesty aside, this is a moment over which we should all be very proud. We finished three arduous years of reading cases, taking notes, outlining for exams, writing papers, journaling, and Socratic Method-ing. For most of us, this moment also marks the end of a life-long journey through formal education. Personally, school—in one form or another—has been the defining attribute of my twenty-eight years. After graduating from college, I spent the next almost three years teaching in NYC schools by day and earning a masters degree in Education by night and summer. Now, after three years at BU Law, for the first time ever in my life, I have no immediate plans (bar review aside) to enter a school or degree program. Though I do have some ideas about one day returning to a classroom—perhaps to teach a first-year legal writing course, volunteer with high school students, or take creative-writing courses—I am now ready to enjoy a post-school professional life. In the meantime, however, I have been spending my time leading up to commencement enjoying law school Senior Week. The week, planned and subsidized by the Student Government, involves events such as a white-water rafting trip, a wine tasting session, and a Six Flags outing. Saturday, I enjoyed a nice afternoon on the patio outside the law school eating BBQ, playing games such as corn hole and water-balloon toss, and observing a pie eating contest. 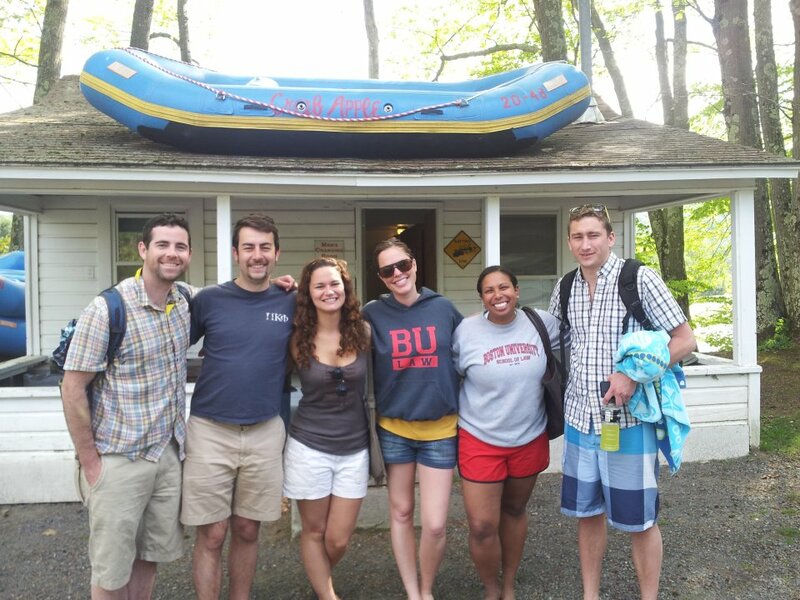 Yesterday, I joined about thirty other law students rafting down a ten-mile stretch of the Deerfield River in western Massachusetts. Just seeing my often-serious peers in unflattering full-body wet suits and booties made the trip worthwhile. But the beautiful weather and scenery, the rollicking ride, and an intense water battle with my fellow rafters made the outing a truly enjoyable one. Next up for senior week—weather permitting—is tonight’s Red Sox game against the Cleveland Indians!